This may sound familiar: you and your partner are sitting in the car, a mere two feet from one another, yet nobody is speaking. You try to start a conversation, but getting your partner to say more than a few words feels like pulling teeth from the mouth of an angry crocodile. You realize that you may have done something wrong, but your partner won’t tell you what it was. A partner’s silence is common in relationships, and it can occur for a variety of reasons. At times, your partner might simply feel like there is nothing to say, and at other times your partner might be punishing you with the “silent treatment.” Distinguishing between the two is important, but usually a no-brainer. 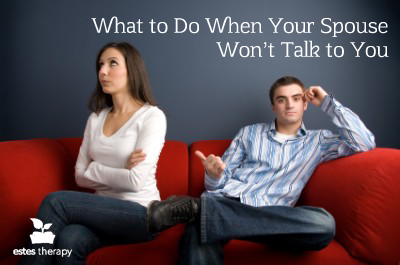 Sometimes, though, you need to communicate and you’re left wondering what to do when your spouse won’t talk to you. Knowing your partner is essential to deciphering the reason for their silence. If your partner is the quiet type, it will be easier to realize that they are being quiet because they are deep in thought, processing, or reflecting on the day’s events. Many partners are often happiest when they sit next to their loved ones without saying a word. It is usually pretty easy for a person to tell if their partner is being quiet out of anger or spite. Angry, or negative, silence can look like passive aggression or avoidance. When introverted people are in conflict, they will retreat within themselves and stop talking to regulate emotionally. Or, they might be quiet around their partners in order to keep the peace “at all costs.” People who feel like any form of talking will lead to a fight will try to keep the relationship peaceful by remaining silent. So, what is the best way to deal with a silent partner? There are two exceptionally important facets to dealing with a partner’s silence: support and attentiveness. First, remind your partner that you care, and try to draw them out with kindness. Think about what specific gestures make your spouse feel loved. Consider when they typically feel safest opening up to you and try to create similar circumstances. Do everything from a foundation of love and support. This will help your partner feel safe enough to discuss whatever is on their mind. In general, be sure to check your tone when talking to a silent partner. Talking too loudly will make your partner feel like you are upset with them personally, instead of upset with the problem, and when someone feels attacked, their natural response will be to attack back or shut down. So, remember to speak softly and regulate the volume of your voice, especially when you are in an argument. Second, listen. Your partner might be trying to tell you something with their silence. Be curious about what the message is, but don’t poke and prod. Relentlessly pursuing your partner when they are being silent will only make them more silent and possibly defensive. Instead, let your partner know that they can tell you whatever is on their mind when they are ready and make yourself available. If your partner is introverted, try to meet them where they’re at. Don’t try too hard to force conversation. Try to give them as much silence as they need. Check in on them if you are concerned, but do so in a way that makes them feel safe. Be curious rather than accusing. Be curious rather than accusing. Don’t underestimate the importance of your own vulnerability. Communicate your emotions surrounding whatever situation is at hand. Admit that you are sad to feel so disconnected. Say that you are afraid of losing her. Tell him you can’t stand the feeling that he might be in pain and you can’t do anything about it. Creating a safe place for feelings means sharing your own. Sometimes just because you know what to do when your partner won’t talk to you doesn’t mean it always works. If you are making no headway communicating on an emotional level with your silent partner, don’t be afraid to seek outside help to recover your connection. – Foley, Todd. “FocusOnTheFamily.” Silent Storm: When Your Spouse Won’t Talk. Focus on the Family, 2013. Web. 16 July 2015. <http://www.focusonthefamily.ca/marriage/conflict/silent-storm-when-your-spouse-wont-talk>. Jake is entering his final year at the beautiful Point Loma Nazarene University in San Diego, where he is studying biology and psychology. Writing is an incurable passion of his, as are conversations and comic books. Jake is currently looking into graduate schools that have psychology or MFT programs, so that he can pursue a career in therapy. His most valuable dream is to work in a field that he loves that lets him have a positive impact on people’s lives. Jake Stowell is a student volunteer with Estes Therapy working under direct supervision of Jennine Estes MFT#47653.